Art history professor Owen Doonan at the site of the North Tower — one of the four sites in the Stones Sounds exhibition — in ancient Sinop. Behind him, the walls are 2,200-years-old. Photo by Gregory Thoma. Doonan and his archeological team have been working on the Sinop Regional Archeological Project (SRAP) since 1992, doing excavations, digs and related research in Sinop — a small town in northern Turkey on the coast of the Black Sea. 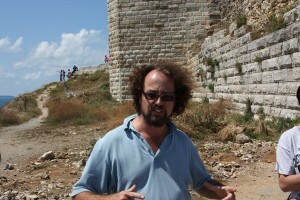 Doonan’s team has identified evidence of people living at Sinop from at least 2300 BC. “The city has had an illustrious history since then as the home of philosophers, kings and saints,” said Doonan. “Diogenes the Cynic of Sinope was famous in antiquity for rejecting the wealth and material trappings of the age. When Alexander the Great offered him anything he might desire, Diogenes asked the great conqueror to stand out of his sunlight, for he was casting a shadow over him. As part of the Sinop Kale Excavations, Doonan collaborated with CSUN graduate students in his Art 542 Exhibition-Design course in the fall of 2016 to create a sound-art exhibition — an artistic presentation where sound is used as the primary basis — to display the history of Sinop Kale. Sound art is the study of Archaeoacoustics, a study within archeology that uses an acoustic environment — a combination of acoustic resources in the area — and soundscapes, a component within an acoustic environment that helps viewers identify an archeological site’s affordances and possibilities. “The students started off learning about how sound arts can represent landscapes and expand on work by artists like Susan Phillipsz to explore the possibilities of representing an archeological site,” said Doonan. The exhibition was first installed at CSUN in the months of February and March and was later installed at The Explorers Club New York in April. Currently, there are discussions with venues in Turkey and Europe about additional installations and preparations of a short film about the piece. In the past 21 years of exploring Sinop’s history, Doonan has documented more than 400 historic sites, ranging from the Paleolithic to Ottoman eras across the rugged Sinop Promontory. The archeological projects are supported by the National Geographic Society, the National Endowment for the Humanities, the Alexander von Humboldt-Foundation, and The Explorers Club, Turkish Airlines and other private sponsors. The exhibition was also supported by the Turkish Cultural Foundation and the Southern California Turkish American Association. To produce Stone Sounds, Doonan worked with artists Sven Anderson— from the Dublin Institute of Technology — and Erkan Akliman from Sinopale. Doonan selected four key sites to represent the area’s distinctive histories, Akliman recorded actual sounds from the site itself and Anderson recreated sounds from the past, edited, designed, produced the sound sequences and worked with Doonan and his students to design the exhibition. Others who helped in the production of Stone Sounds are Hüseyin Vural, the director of the Sinop Archeological Museum, and T. Melih Görgün, founder of the International Sinopale Biennial. The exhibition consists of four specific sites within the large site of Sinop kale: Main Street — the sounds from the city, markets and traffic; The Sabahattin Ali — sounds from the prison cell from the poet Sabahattin Ali and his poem, “Aldirma Gonul” and building ships in the shipyard; the Lonca Gate — sounds from the deconstruction of a 1000-year-old victory inscription and a modern tea house; and the North Tower — sounds from the prehistoric fishing village, wall construction, a battle site and a modern excavation. The Explorers Club recognized Stone Sounds in May with a special event at their headquarters in New York with about 130 guests to honor and experience the history of Sinop. The event also included local dishes from the town of Sinop, a string quartet and singers who performed rare Mozart pieces to represent King Mithridates VI of Pontus who was born in Sinop and made it the capital of his kingdom in 113 BC. The evening also consisted of a lecture by Doonan and the installation of Stone Sounds. For the presentation, guests sat in a darkened room to help immerse themselves into a new time period. A projector’s spotlight would be cast onto one of the four white posters in the room and display an image of one of the four sites. The audience would then hear sounds cascade throughout the room for a limited amount of time. According to Doonan, the average cost of a yearly excavation is $250,000. The grants and donations given by the archeological projects’ supporters fund 60 to 70 staff members and students from around the world to participate in the digs. At the event, Doonan announced the launch of the nonprofit organization The Friends of Sinop Kale Excavations, which will help continue the funding for future digs. “The whole point of the Friends of Sinop Kale Excavations is that we’re launching a group in the support of the excavations and the development of a rich public presentation including a site museum,” said Doonan. Community members and students interested in hearing an archived short film of the Stone Sounds exhibition can email Doonan at owen.doonan@csun.edu.